UNIVERSITY PARK, Pa. - For the first time in program history, the Merrimack College women's ice hockey team downed Penn State 2-1 Saturday afternoon inside Pegula Ice Arena. Goal #1 (1-0 MC) - Similar to Friday's contest, the first fifteen minutes were as balanced as could get; both teams had an equal number of shots on net. It was just after the 15 minute mark where the Warriors struck first. A pass from senior Katelyn Rae found the stick of Jessica Bonfe, who beat the goaltender for her first goal of the season. Goal #2 (2-0 MC) - Just three minutes later, the Warriors doubled their lead. Senior Paige Voight connected with sophomore Courtney Maud, who found Megan Fergusson for the goal. Goal #3 (2-1 PSU) - Penn State was able to cut the lead in half just four minutes into the third period. Katie Rankin connected on a pass from Kelsey Crow, but that was the only time the Nittany Lions scored to finalize the score at 2-1. - Their 3-0-1 record is the best three-game start to any season for the Warriors. - This is the first meeting between the two teams that didn't go into overtime. - Merrimack's penalty kill stays at 100%, after shutting down Penn State twice more today. 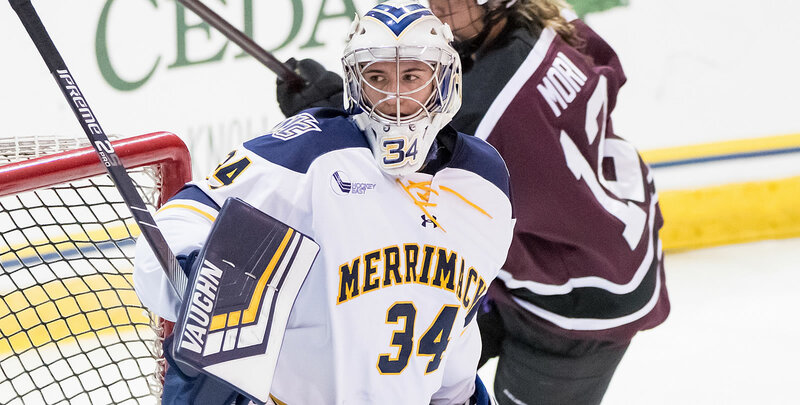 Merrimack will have the next five days off before returning to Lawler Rink Friday, October 12; the first Hockey East Conference game of the season against Boston University will see the puck drop at 7 p.m.